Even though the all-new Mazda3 appears to be yet another modern and attractive design from Mazda, it is actually toned down a lot from the Kai concept. Which, I guess, was inevitable. But a bit too bad. It will probably be one of the best looking compact car in the business. Again. Same thing inside. While the concept was really original, the production version has changed just enough to be much more mundane. The screen integration is not as cool as the concept was. At all. But again, when compared to most of its competition, this is probably one of the best out there. We will see the whole car in just a few days. And I will be at the Los Angeles auto show to report. 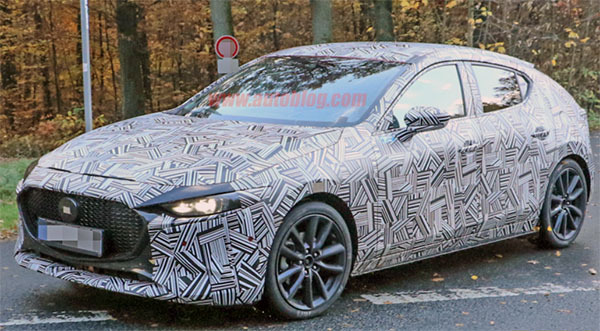 See all the spy shots of the new 2020 Mazda 3 hatchback over HERE. I disagree, Vince. Nothing would look good under all that camo tape, but I'm actually suprised at how closely the shape and proportions follow the Kai concept. 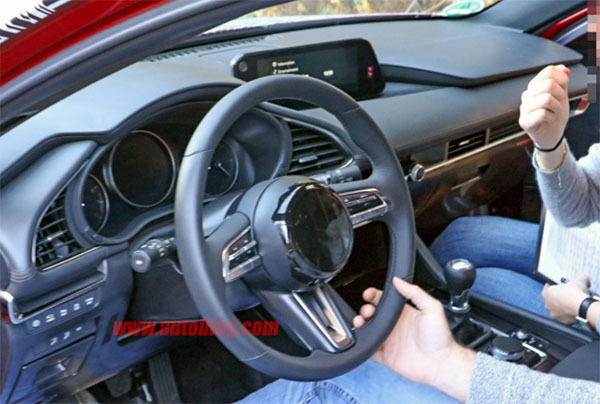 And sure, the concept's infotainment screen was cool, but expecting it to make production, is dreaming in technocolor. We might see something like it next gen Audis, and then trickle down to economy compacts, but that will take years. Vince, that isn't accurate when Mazda based the Kai Concept on the 2019 Axela/3 styling. I can bet as soon I get the whole process publicized of Mazda developing it the past 4 years, you will be wrong. Too short of a time window to engineer a concept like the Kai as the originating design basis into a production car. A waste of resources and atypical. If you're going to be writing on this topics, be a little bit more careful and not so careless with words. Most concept cars are designed 6-9 months before they are revealed. The new Axela/3 final design would be decided on under 2 and half years before it goes on sale. 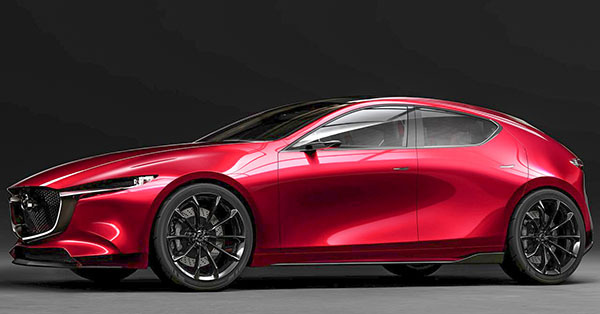 That was around the time Mazda started developing this Kai concept in early 2017. The final production design was actually set in December 2016, but fully locked in by the following summer after work started on the Kai. The problem is writers like you don't seem to understand how car development really works against concept show cars and just make guesses that are way out of touch with how things really do happen behind closed doors. And people naively lap it up like it's fact. Don't you have press credentials? Use them to get the inside scoop more, instead of making off the mark guesses! Easy to tell this is going to be another winner for Mazda. I just really hope the torsion beam rear suspension rumors are a falsehood. Dissapointed in the interior. 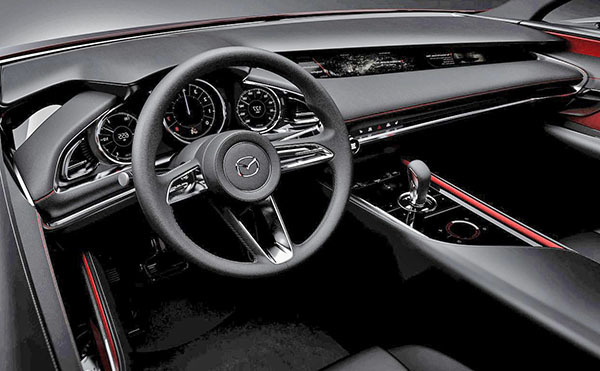 I was giving Mazda credit from the concept interior images that the crazy loiking stick up screens were going to be gone for their next generation vehicles. Oops..I was wrong..
Looks clean and smooth, but this thing better have 10-20 surround cameras because those tiny windows will be next to useless, not to mention incredibly claustrophobic. I doubt Mazda will move forward with a torsion beam rear suspension mostly bcuz almost all makers with it have gotten a lot of negative oress and have moved back to multi link on any compact and larger vehicles. People don't want to pogo stick down the highway, right Honda and VW?